Next Sunday is Palm Sunday. The Mass commemorates the actual “Palm Sunday” events in its unique introductory rites which include the blessing of palm branches, and the proclamation of a gospel account of Jesus’ entry into Jerusalem. This typically takes place at the entrance to the church, or may even take a simple form with the priest leading from the sanctuary. One Mass on the Sunday, however, should commemorate Jesus’ entry into Jerusalem by means of a procession from a location outside the church. As such, we will celebrate Palm Sunday in a similar fashion as in previous years. 9:00 am Mass will begin with a procession beginning under the shade structures in the school playground (outside the parish hall). All other Masses will begin with a solemn entrance beginning in the narthex. Palm Sunday marks the beginning of Holy Week, which leads us to the Easter Triduum. This will be the first time we celebrate the Easter Triduum according to the new English translation of the Missal. There are some changes to texts that we may only use once a year, such as the showing of the cross on Good Friday and the Litany of the Saints. Please be mindful of this. We will do our best to prompt and assist you with any changes. Please take note of the times of the various Holy Week and Easter Triduum celebrations, and make sure you pass the timetable on to others (perhaps there are people in your neighbourhood) who may be interested in participating, but don’t get a Carmel bulletin. Over the course of this year, we have begun to use the new English translation of the Roman Missal. This began first of all with singing parts of the Mass, then the introduction of much of the Order of Mass from Pentecost Sunday. To assist parishioners in becoming familiar with the new Order of Mass, we included the people’s responses that changed on the projection system for people to follow. The danger with constantly putting everything ‘up on the screen’ is that it is easy to become reliant on it. For many years we were able to respond and pray throughout the Mass from memory, and with time, we should be able to do so again. For this reason, the changed responses and prayers of the Mass will not be included on the projection system from next weekend. For those people who are still not completely confident with some of the longer texts (such as the Creed, Confiteor and Gloria), the pew cards of the Order of Mass will still be available at the church doors, and we encourage you to use them when needed. Of course at some Masses our projection system is not used as frequently, so people are used to referring to the pew card. 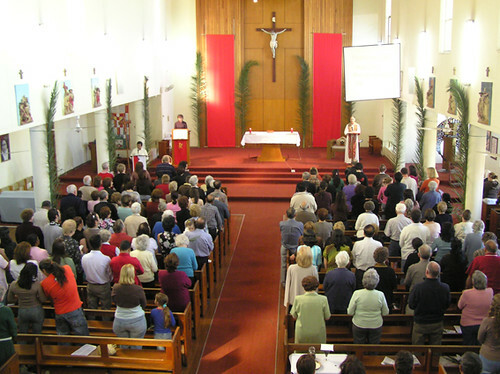 There may be some occasions (such as Christmas this year) when there will be a large number of people present who are not confident with the responses during Mass, and we may use the projection system again for the purpose of displaying responses if we consider it necessary. So from next Sunday, make sure you take a pew card if you think you’ll need it to get through Mass.